First, make sure you’re watering the plants correctly. Next, check that the time and date on your device are set correctly. Lastly, you can try watering plants in the most optimal mode to get the most growth. 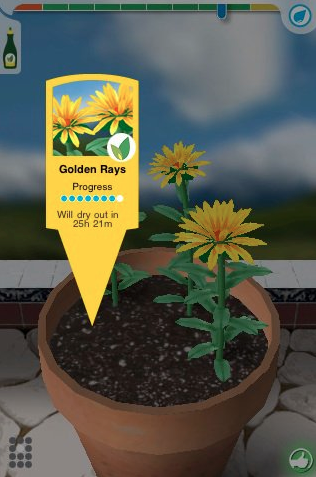 Unlike other games, plants in Flower Garden don’t grow automatically on a timer. Like real plants, they need some care on your part. The best way to take care of your flowers is to give them one good watering until the water meter is as far right as possible (without going into the overwatered area). You’ll see an initial growth spurt, but most likely the flowers won’t bloom yet. Tap on the tag on the pot and you should see how long it will take for the pot to dry. Come back to your garden before that time and give it another full watering. Repeat that and you’ll have blooming flowers in no time. Doing lots of small waterings. If you do that, plants won’t grow as much as if you let them dry out a bit more and do large waterings. Letting plants dry out. If a plant dries out, when you water it it just restores it to health, but it won’t grow that session. You need to wait until the water level drops down again to water it and get it to grow.